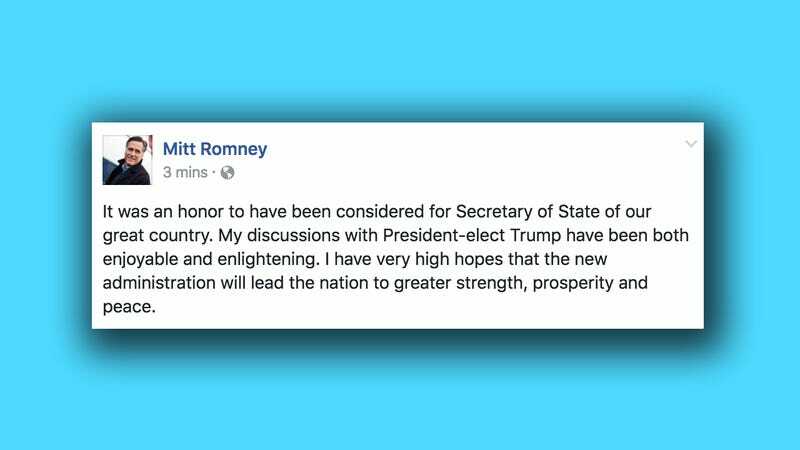 Using a platform beloved by any conservative who wants their story to go viral, Mitt Romney confirmed he will not serve as Secretary of State. The comments on the post are predictably amusing. “That’s very different then what you were saying before the election,” one user wrote. “You are a snake in the grass. Years ago I thought you were a man of good character- but after what you did and said to Donald trump - I know that is not true,” a Trump supporter remarked. “You’re a good man, just wish I was reelecting you for a second term,” one Romney-lover reminisced. A loss for Romney, but a huge win for Facebook.